“I did not know that Bangalore has good Hindi rock bands”, remarked Nandan Kamath. He had just listened to two soulful renditions titled Barsaat and Tum Hi Ho by Indi Graffiti, a four year old band based in the city. This was among the unique acts at the Fete de la Musique 2012 (Festival of Music) organised by Alliance Francaise de Bangalore (AFB) from June 21st to June24th. Comprising of vocalists and guitarists Bharat Rajagopalan, Pearl Mukadam and drummer Glenn Joseph, Indi Graffiti has played to cheering audiences across the city. A non-ticketed event, it was held primarily at the auditorium of AFB with the exception of the opening performance. Incidentally, the Fete de la Musique originated in Paris and is staged by Alliance Francaise in many countries globally. It celebrates World Music Day which falls on 21st June, annually. Anuradha Narayan, teaches at the AFB; she is also the cultural co-ordinator and one of the co-organisers of the event. She said, “Some of these performers have been at the AFB during various gigs and keep coming back whenever possible. The idea is to give space to new and established bands and musicians.” Though this year marks half a century of pop music in France, they are not restricting it to that genre she clarifies. Anuradha added “In fact, we do not refuse anyone who wants to participate here”. The preparation lasted two months and 30 groups performed. They had also invited Indian classical musicians too so as to introduce the genre to French people living in the city. Treppenwitz which opened the show as The Roll Call last year did an encore on Saturday afternoon to a packed crowd. Vocalist Becky, bassist Nihaal, drummer Jo, backup vocalist Karun and guitarist Joshua – all but one of them just having entered college, it was among the youngest of the bands that participated. Eight month old debutant Clown with a Frown had mainly self-taught singers and instrumentalists. Abby, Pramod, Reuben, Abheet and Johnson, all aged between seventeen and nineteen was another of the confident, youth troupes that impressed with their original compositions. “Playing here is an unplanned but welcome opportunity for us!”, they beamed. Sangeetha Swaminathan, a paediatrician from North Bangalore rendered enthralling pieces on the electric violin along with her Indo Western fusion troupe and the band Altered Scales. “I met Michael of the latter group during the previous edition of this event and we decided to get together”, revealed the doctor. Later, Jeevan John of Transit Point enthused the audience to join his head banging rock vocals that featured the catchy number “1981”. While veena vidhushi and teacher Geetha Navale (co-founder of Guruskool) and Mythli Iyengar presented The Devi Project in South Indian classical style, InFusion and The Wishbone Factory entertained everyone with their memorable jazz. Talented children, teenagers and adults from the World Music Centre, Malleswaram under the banner of the 18th Cross Experiment caught people’s attention on Sunday. The two-day line up also had popular groups and individuals such as Galeej Gurus, Thermal And A Quarter, Bicycle Days, Chaitra Sontakke, MoonArra and Rhythm and Raaga. A amateur photographer captures the spirit of the Sunfeast 10K run this year. 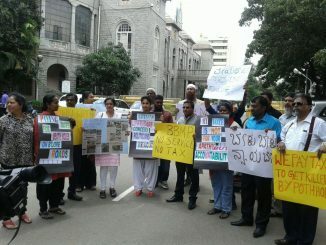 Several citizens of Bengaluru protested against BBMP for failing to provide safe roads. They threatened to boycott paying taxes to BBMP unless their demands were met. No response from BBMP control rooms? Have you ever tried calling BBMP control room to file a complaint? Raghunandan S V shares his experience on the same.